“Stop doubting and believe,” Jesus told St. Thomas. Could Jesus have made any clearer His position on persistence in doubting Him–both to St. Thomas and to us? Surely we all remember the context in which the admonition was given. Jesus had appeared the week before. St. Thomas had been absent, and refused to believe the other Apostles’ testimony about Jesus’ Resurrection, asserting that he needed first-hand evidence. In the most instructive sermon I have heard on “Doubting” Thomas thus far, the priest hypothesized that St. Thomas’ absence from the Upper Room on Easter Sunday, when Jesus first appeared, could be indicative of someone who was terribly disheartened. Perhaps he was angry with himself for having allowed himself to have believed so fully. Frustrated and disappointed in himself for having allowed himself to be “duped,” he chose to go off on his own to lick his wounds. In this light, rather than having a “doubting”/cynical personality, Thomas might have been one who was trusting—maybe too trusting, or maybe he was a very careful, methodical critical thinker, a ponderer who lost confidence in himself, in his ability to trust his own judgment. The priest then called to our attention to the fact that Thomas’s presence with the Apostles a week later likely was the result of their “pleading” with him not to stay alone, but to join them, to once again be part of their community. Notice, the priest emphasized, that Jesus did not go out during the week to meet Thomas when he was alone; He waited for Thomas to rejoin the community. What would have happened to Thomas, the priest speculated, if Thomas had not been humble, had not been willing to risk making of himself a fool again, to believe again? We know how the story ends. Jesus appears. Invites St. Thomas to put his hand in His Side, and his fingers in the marks of the nails. And St. Thomas proclaims, “My Lord and My God!” From that moment in his faith journey, St. Thomas believed enough to suffer a martyr’s death. Surely there was no more doubt—or if there was, there was faith in action despite it. The focus of the remainder of this post about doubt, then, is trust. My capacity to trust God got a gigantic boost when I learned about St. Faustina Kowalska, the first canonized Saint of the 21st Century, and her Diary containing inspirations and teachings (private revelation) about Divine Mercy, which the Church found were not in conflict with Divine Revelation. One thing I know that connects with Spiritual Journey Thursday is that, like St. Thomas, I find it easier to trust when there are others whose faith I can lean on; others who cheer me on. 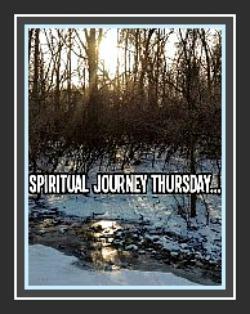 If you have been reading my SJT posts and have been offering your spiritual suggestion-comments, thank you for being part of that faith community. This entry was posted in Belief, Doubt, Inspirational, Trust. Bookmark the permalink. Bobbie, I very much liked the thought about the size of our trust bucket and how it varies. Being human like Thomas means we come to the table with frailties. We need reassurance and support. We need the presence of God to change our course. We trust but we backslid when the pressure is on. Our SPJ community provides a safe haven to exchange thoughts. Your words are comforting today. Thank you so much, Carol, for taking time to read and to comment. Like you, I am so glad for our “safe haven.” As I am each week, I am especially grateful for the SJT posts and comments you share. I’m glad this post has given you comfort; you always give so much comfort (and holy challenge!) to me! God bless you! I love that image of a trust bucket. Your point about the importance of community is also really important, I think. For me, my trust bucket enlarges as I go through stuff and find Him faithful. Of course each new test is another opportunity to enlarge that bucket. Too often, I spend more time than I should concerned about how things will work out (in doubt, you could say). I am trying to learn to trust from minute one on. This is also where the support of others is crucial. Our defenses can be especially low when we’re unwell. How wonderful it is, then, to have the support of encouragement, stories and prayers of others. Thank you for reading/responding! Thank you, too, for being a key member of the SJT community supporting my faith journey. Sometimes even a thimble-bucket is hyperbole; that’s when your advice is so powerful. Next time I’m doubting, I’ll remember His past faithfulness, close my eyes, extend my arms, and present a larger bucket. Thank you! Click on the image to reach Holly Mueller's guest site. Please join us each Thursday! Extra Mercy Jubilee Day Is Here! How shall we spend it (really, invest it)!